We do not know how many monks and nuns were ordained by the Buddha during his lifetime. The early accounts sometimes describe monks and nuns by the thousands, but that is possibly exaggerated. Of these unknown numbers some outstanding individuals emerge. These are individuals who contributed to the development of Buddhism and whose names one finds in the sutras. Through their life stories we can get at least a glimpse of the first generation of men and women who chose to follow the Buddha and practice his teaching. Ananda was the historical Buddha's cousin and also his attendant during the latter part of his life. Ananda is also remembered as the disciple who recited the Buddha's sermons from memory at the First Buddhist Council, after the Buddha had died. According to a possibly apocryphal story in the Pali Tipitika, Ananda persuaded a reluctant Buddha to accept women as his disciples. Anathapindika was a wealthy lay disciple and benefactor of the Buddha. His generosity to the poor earned him his name, which means "feeder of the orphans or helpless." The Buddha and his disciples traveled for most of the year, but they stayed indoors in seclusion during the summer monsoon season. With the Buddha's permission, Anathapindika purchased a property that would be called the Jeta Grove. He then built a meeting hall, dining hall, sleeping cells, wells, lotus ponds, and whatever else the monks might need during their solitary rains retreats. This was the first Buddhist monastery. Today, readers of the sutras may notice that the Buddha delivered many of his discourses "in the Jeta Grove, in Anathapindika's Monastery." Devadatta was a kinsman of the Buddha who became a disciple. According to some traditions, Devadatta became consumed with jealousy of the Buddha. After receiving a particularly harsh rebuke from the Buddha, Devadatta plotted to have the Buddha assassinated. When his plots failed, he split the sangha by persuading many younger monks to follow him instead of the Buddha. The monks Sariputra and Maudgalyayana were able to persuade the wayward monks to return. Some of the early sutras of Buddhism are about enlightened women who teach men. In Dhammadinna's story, the man was the enlightened woman's ex-husband. The Buddha praised Dhammadinna as "a woman of discerning wisdom." Queen Khema was a great beauty who became a nun and one of the chief women disciples of the Buddha. In the Khema Sutta (Samyutta Nikaya 44), this enlightened nun gives a dharma lesson to a king. After the historical Buddha died, Mahakasyapa assumed a leadership position among the Buddha's surviving monks and nuns. He convened and presided over the First Buddhist Council. For this reason, he is called the "father of the sangha." He is also a patriarch of Chan (Zen) Buddhism. Maudgalyayana was a lifelong friend of Sariputra; the two entered the order together. The Buddha's instructions to Maudgalyayana as he struggled with his early practice have been valued by the many generations since. Pajapati is credited with being the first Buddhist nun. She is often called Mahapajapati. Pajapati was the Buddha's aunt who raised the young Prince Siddhartha as her own child after the death of his mother, Queen Maya. After the Buddha's enlightenment she and many of her court ladies shaved their heads, dressed in patched mendicants' robes, and walked many miles barefoot to find the Buddha and ask to be ordained. In a section of the Pali Tipitika that remains controversial, the Buddha refused the request until persuaded to change his mind by Ananda. Patacara was a nun who overcame unimaginable grief to realize enlightenment and become a leading disciple. Some of her poems are preserved in a section of the Sutta-pitaka called the Therigatha, or Verses of the Elder Nuns, in the Khuddaka Nikaya. Punnika was a slave who, by chance, heard a sermon of the Buddha. In a famous story recorded in the Pali Sutta-pitaka, she inspired a Brahmin to seek out the Buddha. In time she became a nun and realized enlightenment. Rahula was the historical Buddha's only child, born shortly before the Buddha left his life as a prince to seek enlightenment. It is said Rahula was ordained a monk while still a child and realized enlightenment at the age of 18. It was said Sariputra was second only to the Buddha in his ability to teach. He is credited with mastering and codifying the Buddha's Abhidharma teachings, which became the third "basket" of the Tripitika. Mahayana Buddhists will recognize Sariputra as a figure in the Heart Sutra. Upali was a low-caste barber who met the Buddha when he was called upon to cut the Buddha's hair. He came to the Buddha to ask to be ordained with a group of the Buddha's high-born kinsmen. 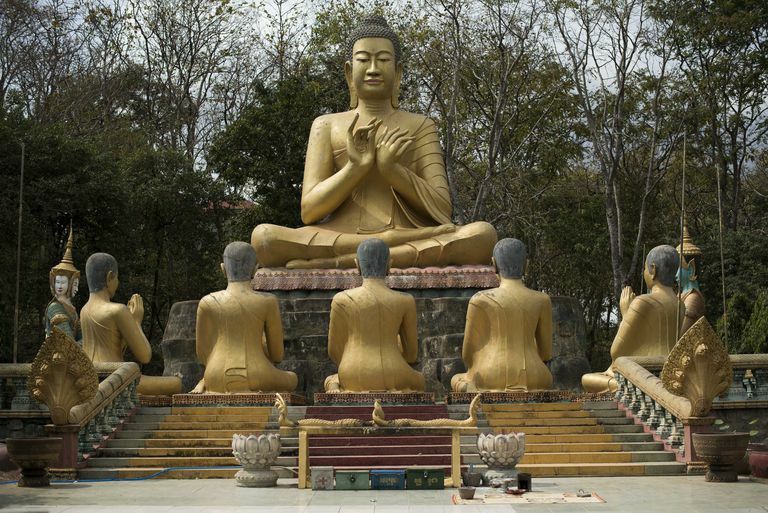 The Buddha insisted on ordaining Upali first so that he would be their senior, and superior, in the order. Upali became known for his faithful devotion to the Precepts and his understanding of the rules of the monastic order. He was called upon to recite the rules from memory at the First Buddhist Council, and this recitation became the basis of the Vinaya. How Did the Buddha Reach Enlightenment?